Thursday 18th July - The July (and a bit of August) roundup continues! First up, a trip to The Miller pub which has had a makeover from the guys behind the excellent Sebright Arms. Upstairs is still a venue for music and comedy, though they haven't yet brought back the high quality Monday night comedy from before the changeover. There is a very lonely ping-pong table (with equipment sadly missing on our visit) on a slightly rundown terrace, but the beer garden below is very nice indeed. The range of beers is good (particularly the bottle list with local offerings from Partizan and Kernel) but their main calling card is the food. No doubt learning from having the popular Lucky Chip guys in house at the Sebright Arms, The Miller team have cleverly brought in the wonderful folk from Street Kitchen who can do no wrong in my books. 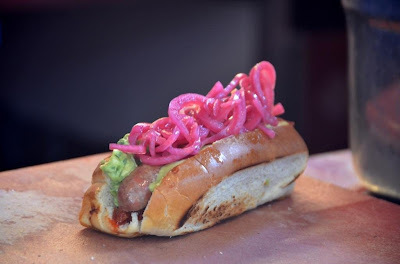 They have developed a special hot dog menu (and more recently some "burger dogs") which you need to try, especially if you don't like hot dogs. They are, unsurprisingly, ridiculously tasty and inventive, and way more substantial than those on offer at Bubbledogs. I can personally vouch for the quality of Boston Hound and Bull Mastiff, and their rosemary salt chips are always fantastic, but the menu may well have changed since I went. One Team List point each for Sam and T.Rex (reliable Team Bermondsey members). Sam stays in 4th with 24 points, whilst T.Rex has worked his way up to joint 19th with 8 points. Monday 14th August - Carrying on with the pub theme, after giving up on a Pitt Cue Co queue and seeking out Wiggies at the Sun and 13 Cantons when they weren't open, we ended up going straight to the Lyric Soho pub where our night was supposed to end anyway. 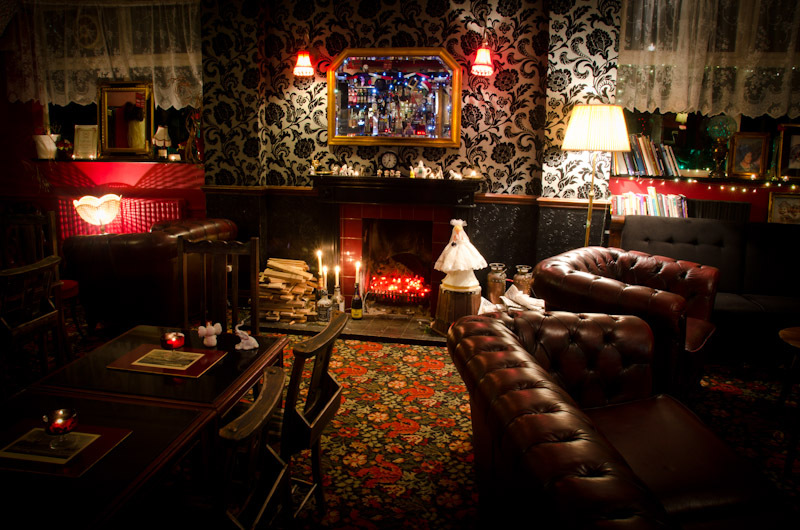 It's a charming little Victorian boozer, thankfully just out of reach of the Piccadilly tourists, with an excellent beer selection. 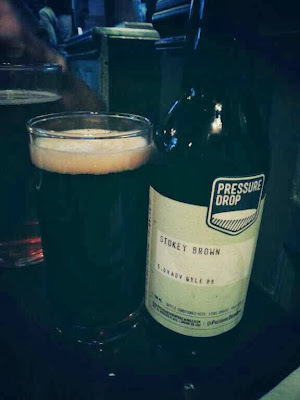 Camden, Magic Rock, Thornbridge, Harbour, Hop Union and more were on tap when I was there, and I also couldn't resist trying a bottle of Pressure Drop's Stokey Brown (brewed by 2011 Masterchef winner Tim Anderson, who is opening his restaurant Nanban soon). 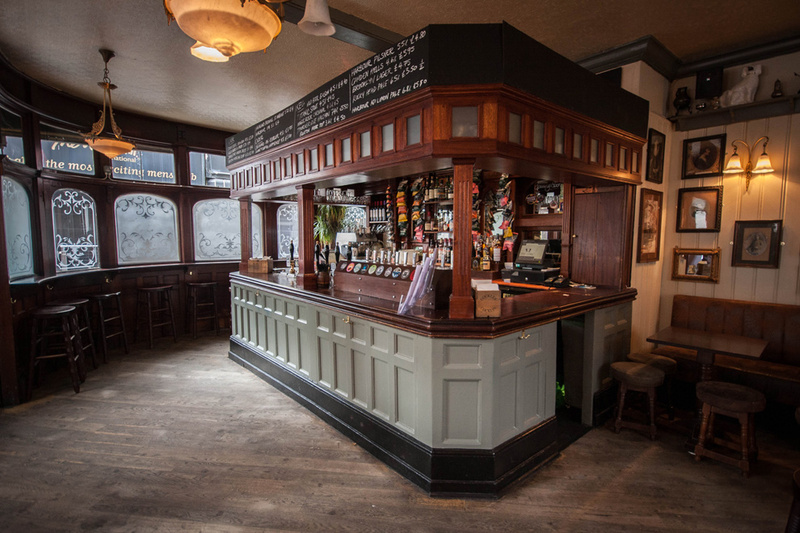 The service was friendly and humorous throughout, and we bonded with the bar staff as Broad took 6 wickets on the Ashes highlights showing in one corner of the room. The food menu has every pub dish you could want on it - pies, scotch eggs, sausage and mash etc - and we took our time trying to decide. In the end we were all deeply satisfied with our pulled pork, steak, pork belly, chicken wings, and salt & pepper squid - delicious! Next time I might go along on a Tuesday for Carnivore Club when several of the meaty dishes are served with a complimentary pint of beer. Alternatively, I might go along for Saturday brunch (11-3) as that menu is very appealing too. Yet another reason to come back is to fill up my brand new beer loyalty card - buy 9 get 1 free! 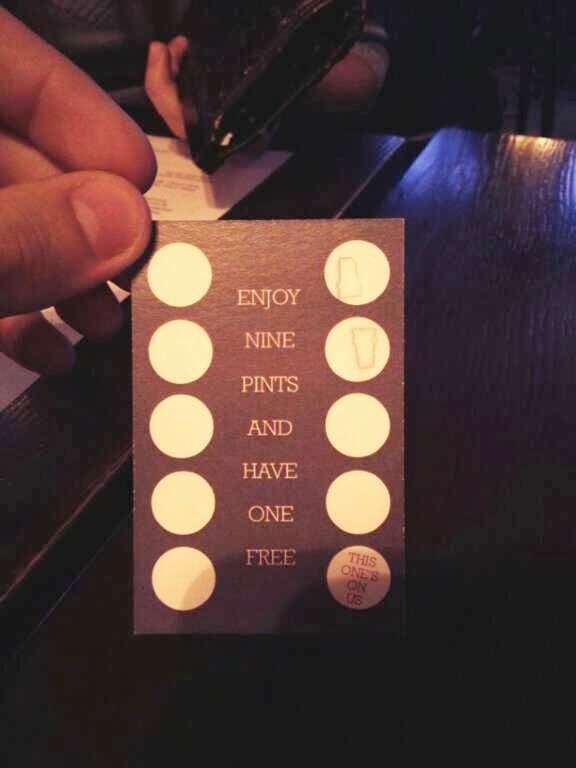 With so many great pubs out there at the moment, who can blame them for giving that extra incentive to return? I would like to see more places rewarding loyal customers as opposed to first timers. One Team List point each for flatmate Ali, Stu and birthday girl Cath. Bristol based Stu is down in joint 27th with 4 points to his name, whilst Cath and Ali are tied for 8th on 15 points with several others. Sunday 14th July - Just one more pub, I promise. On the morning of the 14th, several key female members of Team List impressively ran a Race for Life 10k, and they all dealt with the aftermath in different ways. 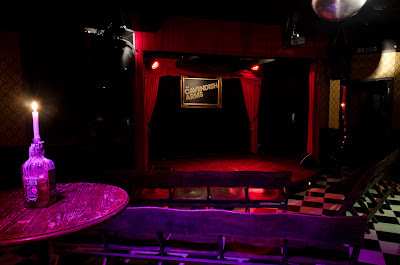 Lauren decided that the best plan was to then go and watch stand up comedy for the rest of the day in a very cold room in a pub on an estate in Stockwell. 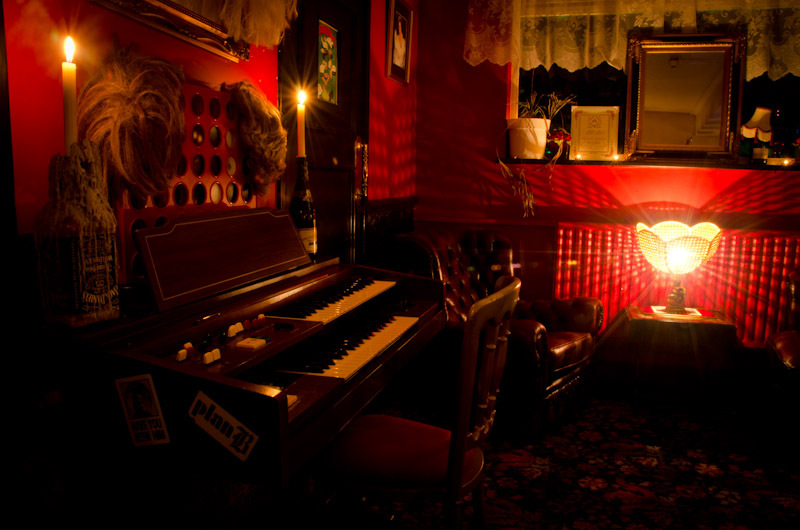 The Cavendish Arms is a crazy little pub with bonkers decor, a Dead Secret Garden ("enter through the thrown away Christmas trees"), a spacious beer garden out front, and a decent gig venue for music and comedy tucked away inside. They even have a pub organist, Tam, who has lived in Stockwell for 25 years. We were there with List Leader Natalie to watch some Edinburgh Fringe preview shows from the likes of Daniel Simonsen (not at all ready) and Jimmy McGhie (more ready, and more importantly to the girls, very attractive), for £5 a show or £10 all day, but most events at the Cavendish are free - a quirky little place, well worth a look. Flatmate Maggie turned up as one comedian finished, and we decided to wander over, sans Lauren, to Little Portugal (technically most of Stockwell, but specifically several bars and shops on South Lambeth Road) to go to one of my favourite discoveries from last year, Bar Estrela. 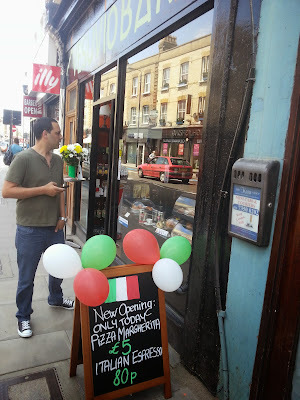 During Euro 2012, Tim (Team La Liste) and I sought out different European bars so that we could capitalise on the fun atmosphere without the pressure of watching England. Bar Estrela was our greatest find, and we got swept up supporting Portugal, singing Portugal Allez at the top of our lungs. The atmosphere was incredible, and the traffic outside came to a stand still as people opened the roof of the cars and waved Portuguese flags around. I decided to return to see if it was still fun without the football and thankfully it is. As soon as you step on to their part of the pavement, you feel like you have entered Portugal. We sat outside in weather worthy of Iberia, and had various small plates of food and pints of Super Bock, before finishing off their last three nata (those incredible custard tarts). 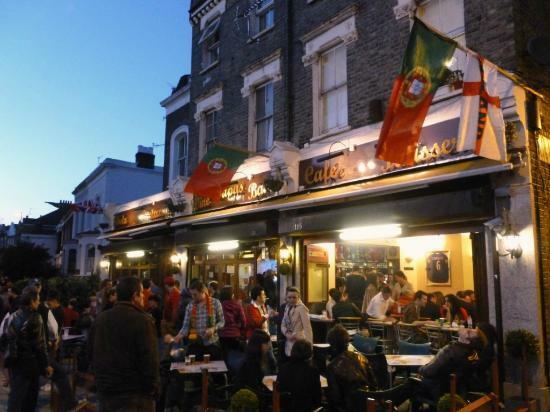 It's the perfect place to spend a lazy evening outside, or even better, to watch football with real fans - head down there for Northern Ireland vs Portugal on 6th September, or hold out for Benfica vs Porto on 12th January next year! Natalie and Lauren maintain their places as No.1 and 2 on Team List, and Maggie moves to 5th place with 4th placed Sam in her sights. If anyone reading this lives around Battersea Park Road, try and make it over to the new Vesuvio Cafe/Bar which opened recently. It is run by a charming bunch of Italians who don't speak much English, and after one day of opening all the other Italians in the area seemed to know the owners. They serve little pizzas, sandwiches, desserts and drinks from frozen cafe creme (basically ice cream) to Peroni, with Italian TV playing in the background. Fingers crossed they show some Italian football and get a loyal following, as many places on this bit of road don't last very long. Last but not least, go and check out Team List regular Lauren's hilarious new blog (link below) where she collates ridiculous messages sent to her and our friends on dating websites, including recently a ludicrous electro song clip composed just for her. Be warned - some are offensive, whilst others just want to know if she wants to purchase a banjo. Contributions are welcome - leave a comment on her blog!